The Gerber Strong Arm fixed blade knife has serious potential. Gerber Gear was ready for SHOT Show with several new knives and tools this year, and the first to catch my eye was the Strong Arm Fixed Blade knife. I have come to appreciate the quality craftsmanship and functionality of Gerber knives and tools over the years and this year was no different. For that reason, they are one of our standard stops. Gerber has been making survival knives for the US Military since 1968. The StrongArm Fixed Blade carries on our legacy of tough-as-hell fixed blade knives for combat and survival applications. With a sheath that can be mounted in a variety of ways, this knife offers reliable use whether on-duty or off. The Gerber Strong Arm features a full tang 420HC blade with black ceramic coating. The blade comes in fine edge, or partially serrated options, and was designed around the fundamentals of military survival training. The Strong Arm provides a solid grip in all conditions with its diamond-texture rubberized handle. This handle was easy to hold, and the rubberized texture seemingly stuck to my hand. The Strong Arm’s diamond-shaped rubberized handle is an excellent grip. The pommel at the base of the Strong Arm handle is designed for striking, and can function to break through hard surfaces or glass for effective rescue operations. The ceramic coating on the blade offers corrosion prevention for long life of the blade. The striking pommel is designed to break windows and more. 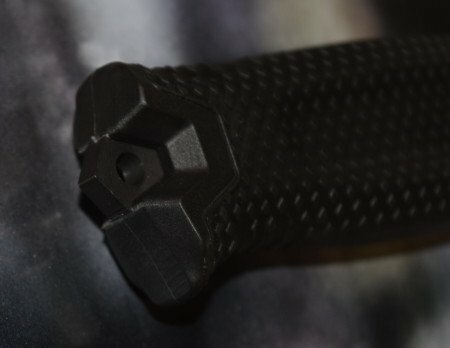 The Strong Arm’s modular sheath system is an important feature as well. With the sheath’s snap-together components, the operator can mount the knife vertically on MOLLE, horizontally on a standard 1.75” tactical belt, or in a traditional drop-leg belt mount fashion. The Strong Arm Fixed Blade is designed and built in Portland, Oregon, and is priced nearly $40 less than the cost of the Gerber IMF II with similar features. The Nylon and Polymer sheath provides excellent protection of the knife and carry options for the user. The Gerber Strong Arm has a fine edge, or partially serrated blade option. The Gerber Strong Arm comes in Black or FDE. As I mentioned, the Gerber Strong Arm stood out among many fine Gerber knives and tools. When I picked it up for closer examination I was not disappointed. The coated steel is strong and will likely hold its edge well in a variety of uses. The handle has a sure grip that is comfortable to hold. Having a striking pommel is an important feature for any law enforcement or survival knife, and the sturdy nylon sheath provides several carry options. Overall I like the Strong Arm very much, and feel it could be an outstanding choice for a work knife. I have no misperceptions about wearing this in the open on my uniform, but this could easily come to use in my go-bag or on my tactical gear. At the Strong Arm’s price of only $86.00, its hard to find a reason not to own one.